Christmas came early this year for gray wolves thanks to an awesome ruling handed down by a federal judge that immediately reinstated federal protection for them in the Great Lakes region. The ruling affects wolves in Michigan, Minnesota and Wisconsin, and, unless overturned, will stop these three states from holding any more hunting and trapping seasons, which is expected to protect an estimated 3,700 wolves. While it’s a big victory for wolves and their advocates, it comes after hundreds have been killed in these states since they were stripped of protection two years ago. Michigan’s hunt was canceled this year, but each state has held hunting seasons, while Minnesota and Wisconsin both allowed trapping and both also shamefully managed to go over their quotas this year. The Humane Society of the United States, Born Free USA, Help Our Wolves Live and Friends of Animals and Their Environment challenged the delisting in court, arguing that it violated the Endangered Species Act (ESA) and that state regulations wouldn’t be enough to protect them or ensure their survival. On December 19, the court agreed. In her ruling, U.S. District Judge Beryl A. Howell said that the U.S. Fish and Wildlife Service’s (FWS) 2012 decision to delist wolves and hand management over to the states in question was “arbitrary and capricious” and violated the ESA. 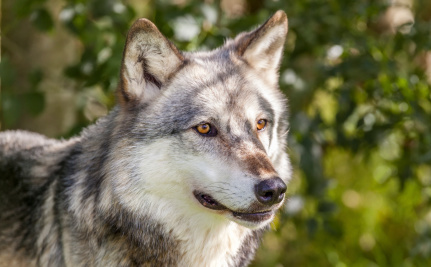 “The FWS’s final rule challenged in this action is no more valid than the agency’s three prior attempts to remove federal protections for a population of gray wolves, which are otherwise members of an endangered species,” Howell wrote. The LA Times reports that Howell also criticized the states’ management plans for not doing enough to protect wolves, particularly in Minnesota, which has allowed “virtually unregulated killing” throughout large portions of the state. In total, since they were stripped of protection, more than 3,400 wolves have been hounded with dogs, trapped and shot, while more than 600 have been killed this year alone since hunting seasons opened in September. That is no clearly way to “manage” a species trying to recover from the hostile actions that wiped them out in the first place, and will certainly not ensure their presence is restored in the Northeast, West Coast and southern Rocky Mountains where thousands of square miles of suitable habitat for them has been identified. Wolves like Journey in Oregon and Echo, who recently appeared at the Grand Canyon, have offered hope and showed us they are still trying to disperse and find homes and mates in new areas. At least reinstating protection is a promising start for their future. This victory also comes on the heels of another legal one that reinstated federal protection in Wyoming earlier this fall. In that case, U.S. District Court Judge Amy Berman Jackson ultimately ruled that the state’s plan was inadequate and unenforceable and that it was “arbitrary and capricious” of federal officials to accept it in the first place, relying on the state’s non-bonding promises to maintain a particular number of wolves. While wolf advocates continue to oppose the senseless persecution in states including Idaho, Montana and Washington and fight to ensure this iconic species keeps its rightful place in the wild, we still have to wait and see what will happen with the FWS’ proposal to strip federal protection for gray wolves throughout the U.S., which should be decided soon. Wolves are dying from unnatural human persecution all over the continent elsewhere. Do NOT celebrate, but, instead CHANGE THIS CULTURE. You are dealing with profound socipathic individuals, selfish utilitarian users of the Earth, and powerful corporatinos who recognize that Endangered species of every kind pose a threat to their mining, "developing", intruding with monstrous machinery, asphalt, bulldozers. Until the mental/psychological aberration constituting the basis of the worldview perpetuated by those involved in these values (or more properly, lack of values other than $) is tiself eradicated from this or any culture, innocents of all kinds will needlessly, tragically, uselessly die. Gun ownership must be ended, the cruel practice of trapping/snaring, ended. Although this is good news, I do expect those states to appeal. The fight is not over and we need to support that fight in these states and the western states too. The video was very informative and to the point. It was hard to watch but it put the blame right where it needs to be: on the ranchers. The video is so beautiful. But they should let us see the faces of the criminals who kills the wolves. Why do they protect them? This decision came none too early for wolves in Wisconsin. I will NEVER understand how shooting an animal who is caught in a trap is considered a "hunt". We were also the only state to allow dogs to hunt wolves. Even crazier was the ruling that if a dog was killed during a wolf hunt the taxpayers had to pony up $$$ to the hunter to reimburse him/her for the loss of their dog. This is very good news, but there is still a lot to do.. While this is wonderful news, it is by no means the end. Keep fighting for the animals!! !